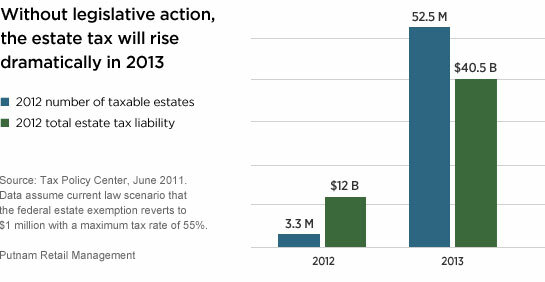 In addition to a growing number of heirs set to inherit from the previous generation, a significant increase in the federal estate tax is looming for 2013 unless Congress acts. As more households are subject to estate taxes at death, it is critical for heirs to be aware of tax considerations in order to access tax advantages, such as the deduction for income in respect of a decedent or IRD. What is the IRD tax deduction? Income in respect of a decedent (IRD) is income that was owed to a decedent at the time he or she died. IRD may include retirement plan assets, IRA distributions, unpaid interest and dividends, salary, wages, and sales commissions. Items of IRD, along with other estate assets, are eventually distributed to the beneficiaries of an estate. While the beneficiaries receive most assets of the estate free of income tax, IRD assets are generally taxed at the beneficiaries’ ordinary income tax rate. However, if a decedent’s estate has paid federal estate taxes on the IRD assets, a beneficiary may be eligible for an IRD tax deduction based on the amount of estate tax paid. With tax advisors and attorneys focused on the estate-tax return and the transfer of assets, it is easy to overlook the potential for heirs to benefit from IRD deductions. IRAs passed on to the next generation are a common form of IRD. This type of transfer has increased significantly over the past decade as more assets have flowed from retirement plans into IRAs. These non-spouse beneficiaries are required to take mandatory distributions from these accounts regardless of the age of the IRA owner at death. Assuming the IRA holds pretax funds, heirs must report these mandatory distributions on their tax return as ordinary income. However, if the estate of the deceased IRA owner was subject to estate taxes, a valuable tax deduction is available to IRA beneficiaries. This tax deduction can be used to offset a portion of the income received as distributions from the inherited IRA occur. Many clients will miss this deduction, resulting in overpayment of taxes. In fact, if heirs realize the tax deduction has been missed following years of taking IRA distributions, they can recoup some of those lost funds by filing an amended tax return for previous years (up to a maximum of three years prior). Are clients paying too much in taxes? 1) Have you inherited an IRA or retirement plan within the past three years? If answer “yes,” proceed to the next question. 2) Was the IRA/retirement plan from a large estate (i.e., did that estate have to pay federal estate taxes)? If answer “yes,” proceed to the last question. 3) As you have taken required distributions from the IRA/retirement plan, have you been claiming a tax deduction for income in respect of a decedent (IRD)? If “no,” then the individual should consult with a qualified tax professional. For more details on IRD and claiming the tax deduction, download our investor education piece, Many heirs miss out on a valuable tax deduction. or IRS publication 559, Survivors, Executors, and Administrators. *Bureau of Labor Statistics, January 2011.